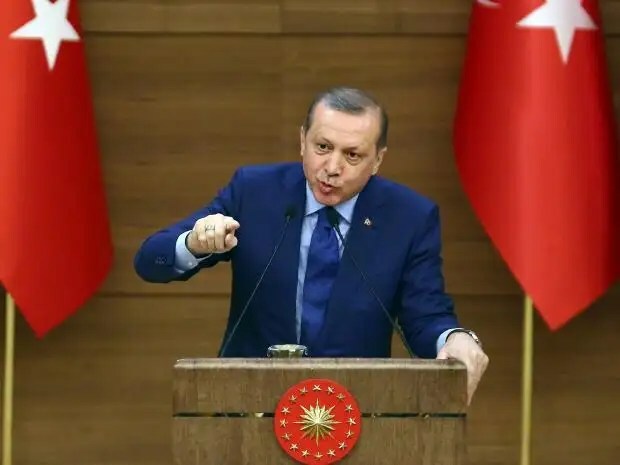 Erdogan, President of a nation that is moving closer to its democratic allies, recently declared that phrases such as “democracy, freedom and the rule of law” have no value in Turkey today. It’s not the first time he’s declared that he doesn’t mind being non-democratic if it achieves his goals. It’s hardly even newsworthy anymore, given that his reforms have already undermined democracy. But he’s not alone. Russia, Hungary, China, Poland, Thailand, Ecuador, Senegal, the Czech Republic, Bulgaria, Romania… The list goes on and on. All of these countries’ political elites are challenging democracy. In fact concerns about democratic backsliding have been present ever since the mid-nineties. Today, there is almost no debate left that democracy is being challenged by authoritarianism. Yet perhaps more worrying is that these challenges are not limited to the peripheries – countries where democracy is only one or two generations old. In developed, western, liberal, democratic economies, the elites have more deeply vested interests in the existing status quo. So it’s perhaps understandable how little serious analysis exists in these countries. However, millennials (people born from the early eighties to the late nineties), and perhaps even more strongly Generation Z (those who are still teenagers today), have worse career prospects than their parents. It is a fact that these generations seem to be well aware of. Indeed, of 42 nations surveyed by the WHO, the life satisfaction of those aged 11-15 had gone down everywhere! Furthermore, those who polled as being the least happy were all in Europe: Macedonian, Polish, and British teens had the lowest happiness levels. 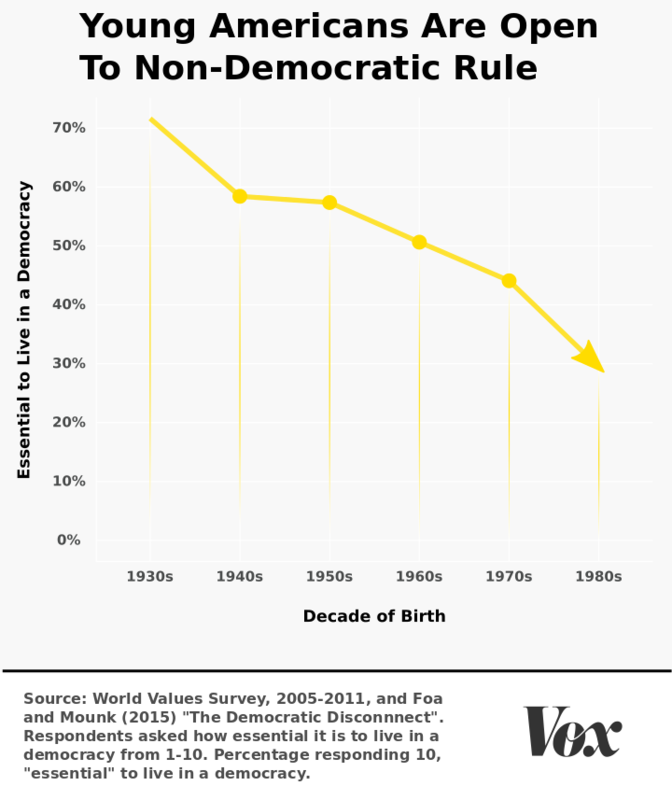 But it’s not restricted to Europe either (see the number of Americans open to non-democratic rule in the chart on the right). As an extreme example of changing sentiments, the US Center for Disease Control and Prevention reported that a staggering 17% of high school students have seriously considered killing themselves! As a millennial myself, I find it bizarre that I am at once continually shocked by such news, and yet at the same time in agreement with many of those surveyed. I am extremely pro-democracy. But I do not believe that democracy is headed in the right direction. I do not believe that what most people think of as democracy (an election, even with Proportional Representation) reflects the ideal type of democracy (no I don’t mean direct democracy, so please don’t comment about it). And I share the cynicism of those surveyed when it comes to the levels of trust we can vest in established institutions, be they corporate, or governmental. I too, was raised with the idea that I could achieve what I wanted if I worked hard enough for it. As an adult, it doesn’t take long to find out how relative that notion truly is. Are Generation Z finding out these harsh truths earlier? Or are they being extremified, and indoctrinated by media-friendly clips, which only show one small piece of the puzzle? Regardless, these generations are extremely unhappy with democracy today. With such dissatisfaction, when voters feel lonely, oppressed by the day to day necessities of life, and alienated by politically correct politicians and executives who seem more machine-like than authentic; is it not natural to see a lurch towards populism? In populists such as Italy’s Berlusconi, America’s Donald Trump, Turkey’s Erdogan, and many others, people often see someone who is authentic. Take Trump for example. His language is every day. He says whatever comes into his head, just as if he were sat in the pub talking with his mates. Whatever the reason for it, it’s worrying to see such a lurch from democracy to populism, and for a myriad number of reasons. It evidences our growing frustration with a political system that we don’t perceive to have delivered. In demonstrating that populism has such potential, it further undermines our faith in the political system as we know it. And perhaps worst of all, because the present political system is identified in peoples’ minds with democracy, and its challenges are coming from populist and authoritarian sources as opposed to reformists; it leads people away from identification with democracy. A recent Guardian article cited several surveys showing that, for example, only 42% of Australian 18- to 29-year-olds thought democracy was “the most preferable form of government”, compared with 65% of those aged 30 or above. A recent poll in Canada found that less than 50% of young adults favour democracy. Having followed such polls for several years now, I can certainly notice a trend. But where will it lead? Are we giving up on democracy? Or are we simply, and finally, casting off that arrogance that once saw us declare that our political and economic systems heralded an ‘end of history’? For now, the verdict is out. “Are we giving up on Democracy”? Your statistics say Yes. Is it because people don’t value democracy, or is it because people feel it is not valuing them? I expect we agree on all the points you noted, i.e. that people do not feel engaged or consulted or represented. Instead they only feel governed. Beyond noticeable facts that the wealth of elected representatives is markedly different from the majority of citizens they represent, I would also like to suggest that the lack of available time working class people have outside of work commitments means that they are not able to engage substantially with any of the democratic feedback systems that are supposed to assist a functioning democracy. Instead they work hard, and only become noticed to the representatives when the statistics become available. Hence they are mere numbers who only get attended to when they become relevant as a voting block. Unfortunately by this time, many of them have long since stopped voting. Why the people do not value democracy? Because they feel that its not working, whoever they choose they feel that political (and media) elites are dis-attached to society. I think its starts from family crisis and society on neighbourhood level. On a state level is just next stage of the same phenomena. Thanks for your comments. Your contrasting answers are very interesting! Sean, you seem to argue that democracy has given up on us; whereas Krzysztof, you seem to argue that society has given up on democracy. First of all, let me point out that the statistics I used in this article display only one small part of the whole picture. I could also have said that the number of people contacting public officials at all levels of governance has markedly risen over the past three decades. In 1976 only 17% of Americans contacted any public official, compared with 44% just contacting their member of congress in 2008 (Boundless Political Science. “Other Forms of Political Participation.” 21 Jul. 2015). I could also have cited the rising number of small donations given to political causes. Or, perhaps most significantly of all, I could have cited the growing numbers of people involved in single issue causes e.g. protests, campaigns, marches, petitions etc. Just as membership of supermarket style political parties has declined, so has membership of single issue groups risen! So the question as to whether the public has given up on democracy has certainly not been answered. Indeed I would personally argue that people in the west remain committed to democracy. However, our taste for pragmatism has certainly not helped democracy’s case. Whereas pragmatism aims for results, democracy is far more complex. As pragmatists, we expect democracies to deliver, and all too often believe that there either is a democracy, or there isn’t i.e. it’s black or white. If we’re told that there is a democracy, and yet our level of happiness is in decline, then it is only natural that we assume democracy is failing us. Indeed both of you touched on feelings as the main reasons behind this discord. I would wholeheartedly agree with that – that feelings and perceptions, as opposed to quantifiable results, are the most crucial aspect in the relationship between democracy and the people. I’d be interested in hearing you elaborate further, and particularly if you have any personal examples. I think that’s the same. For the single issue involvement look on examples how it is treated by MPs (or EMPs), looks like its necessary evil, Citizen’s legislative approaches are discarded on first occasion. Krzysztof I’m not sure I agree with you here. Can you give some examples of citizens’ initiatives that have been discarded without consideration?